Trying to customize your Apple Watch through the settings feature? It's easy to do, especially when you understand the way the watch is set up and where each setting is located on it. Even without third-party apps, such as those found on Android watches, the watch provides a litany of base features that can be controlled through its Settings interface. To access settings, tap the gray and white gear-shaped icon found on the watch's Home Screen. Each option presented within this interface is described below and listed in the order in which it appears on your device. As you select each option, you'll find new commands and features to try out. You can change the time shown on your watch face through this option, moving it up to 60 minutes ahead via the wheel and the accompanying Set button. If you find that you're often late for meetings, or anything else for that matter, this self-induced psychological trick may be just what you need to put a little extra pep in your step and get to where you have to be a few minutes early or actually on time! What to know: This will only affect the time shown on the face, not the value used by alerts, notifications and alarms on your watch. Those functions will still use the actual, real time. This section contains a single button which toggles Airplane Mode off and on. When activated, all wireless transmission on your watch is disabled including Wi-Fi and Bluetooth as well as all cellular communications such as phone calls and data. Airplane Mode can come in handy while in flight (obviously) as well as any other situation where you'd like to stifle all communication methods without powering off your device. What to know: While enabled, an orange airplane icon will be displayed towards the top of your watch's screen. Your Apple Watch can be paired with a number of Bluetooth-enabled accessories such as headphones or a speaker. Any Bluetooth devices that are in pairing mode and within range of your watch will appear on this screen and can be paired by simply selecting their respective name and entering a key or pin number if requested. The Bluetooth screen contains two sections, one for standard devices and another for those specific to tracking your health. 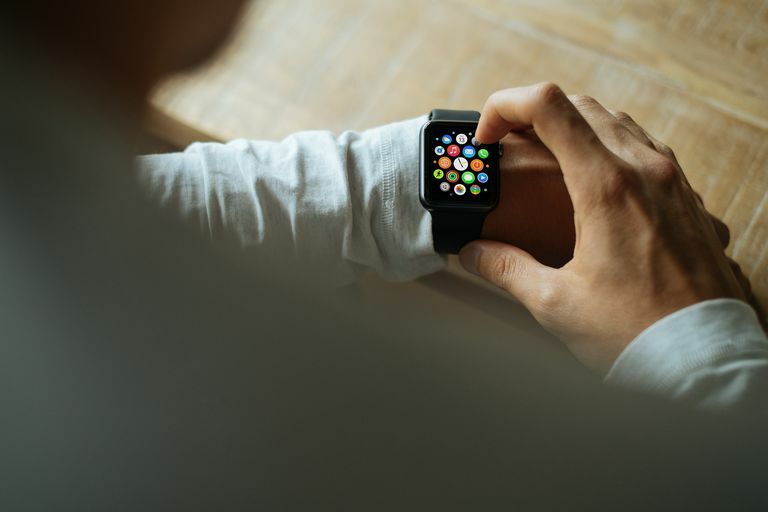 One of the most commonly used purposes of the Apple Watch lies in its ability to monitor such data, including your heart rate and daily activity. What to know: To disconnect a Bluetooth pairing at any time, select the information icon next to its name and tap on the Forget Device option. Another section containing just an on/off button, Do Not Disturb mode ensures that all calls, messages and other alerts are silenced on your watch. This can also be toggled on and off via the Control Center interface, accessible by swiping up while viewing your watch's face and tapping on the half moon icon. What to know: While active, this same icon will be consistently visible towards the top of the screen. The General settings section contains a number of sub-sections, each outlined below. The About section provides a bounty of important information about your device, including the following data points: device name, number of songs, number of photos, number of apps, original capacity (in GB), available capacity, watchOS version, model number, serial number, MAC address, Bluetooth address and SEID. What to know: This section is often overlooked but can be useful when troubleshooting an issue on your watch or a problem with external connectivity, as well as determining how much space you have remaining for apps, photos, and audio files. The Orientation settings allow you to specify on which arm you plan to wear your Apple Watch as well as which side your Digital Crown (also known as the Home Button) is located. What to know: Under the Wrist heading, tap on Left or Right to coincide with your desired arm. If you've flipped your device around so that the Home button is on the left-hand side, tap on Left under the Digital Crown heading so that your device functions as expected with this physical orientation switch. To conserve battery life, the Apple Watch's default behavior is for its display to go dark whenever the device is not in use. The multiple settings found in the Wake Screen section allow you to control both how your watch wakes from its power-saving slumber as well as what happens when it does. Towards the top of the screen is a button labeled Wake Screen on Wrist Raise, enabled by default. When active, simply raising your wrist will cause the watch's display to turn on. To disable this feature, simply tap on the button so that its color changes from green to gray. Below this button is a setting titled On Screen Raise Show Last App, containing the following options. What to know: The final Wake Screen setting, labeled ON TAP, controls how long your display remains active after tapping on its face and contains two options: Wake for 15 seconds (default) and Wake for 70 seconds. This security-driven setting can detect whenever your watch is not on your wrist, and automatically locks the device accordingly; requiring your passcode to once again access its interface. What to know: While not recommended, you can disable this feature by tapping the accompanying button once. You may have noticed that your Apple Watch can sit comfortably on its side while connected to the standard charger, making it an ideal nightstand alarm clock when it's not on your wrist. Enabled by default, Nightstand Mode will display the date and time horizontally as well as the time of alarms that you may have set. The watch's display will brighten slightly as it gets closer to the time your alarm will go off, intended to ease you into waking up. What to know: To disable Nightstand Mode, select the button found at the top of this section once so that it is no longer green. The watch's accessibility settings help those who may be visually or hearing impaired get the most from their device. What to know: Each accessibility-related feature described below is disabled by default, and must be individually activated via this settings interface. VoiceOver: Activates an integrated screen reader which guides you through the main features of your watch as well as all of its native apps such as Calendar, Mail and Messages. The VoiceOver reader is available in over two dozen languages. Zoom: Enables a virtual magnifying glass that can enlarge your display by up to fifteen times. Reduce Motion: When active, the movement of major screen elements including your Home screen icons is simplified and tied closely to your own navigation gestures. On/Off Labels: Accompanies all on/off buttons with a label clearly stating whether that setting or option is currently active. As is the case on Apple's other portable devices like the iPad and iPhone, Siri is available on the Apple Watch to serve as a virtual personal assistant on your wrist. The main difference is that while Siri is also voice-activated on the watch, it responds through text rather than speaking back to you like it would on a phone or tablet. To talk to Siri, simply wake your watch's display through one of the aforementioned methods and speak the words, Hey Siri. You can also access Siri's interface by holding down the Digital Crown (Home) button until the words What can I help you with? appear. What to know: Siri's settings section contains one option, a button used to toggle the feature's availability on your watch. It is enabled by default and can be deactivated by tapping on this button once. The Regulatory section does not contain any configurable settings, but rather information about your device including model number, FCC ID and country-specific compliance details. This is the final section found under General. The Reset section of the Watch settings interface may contain just one button, but it's probably the most powerful of them all. Labeled Erase All Content and Settings, selecting this option will reset your phone to its default state. This will not, however, remove Activation Lock. You will need to first unpair your watch if you'd like to remove that as well. Due to the relatively minute screen size of the Apple Watch, being able to tweak its appearance is sometimes a necessity, especially when trying to view the contents in poor lighting conditions. What to know: The Brightness & Text Size settings contain sliders that allow you to adjust the screen's brightness, the size of verbiage in all apps that support Dynamic Text as well as a button that toggles an overarching bold font off and on. The Sound & Haptics settings allow you to control the volume level of all alerts via the slider at the top of the screen. Scroll down to the slider labeled Haptic Strength to dictate the intensity of the taps that you feel on your wrist whenever there is an alert. What to know: Also found in this section are the following buttons, interspersed with the above slider controls. Silent Mode: Audio alarms and alerts are muted whenever this option is enabled. Prominent Haptic: When this option is turned on, an extra tap is added to all common alerts. Tap to Speak Time: Enabled by default, this setting causes your watch to audibly announce the current time whenever you tap on the Mickey or Minnie Mouse character on the device's face. Your watch's passcode is very important, as it safeguards from unwanted eyes accessing your private messages, data and other sensitive information. What to know: The Passcode settings section allows you to disable the passcode feature (not recommended), change your current four-digit code as well as enable or disable the Unlock with iPhone feature; which causes the watch to automatically unlock whenever you unlock your phone, as long as it is on your wrist at the time.